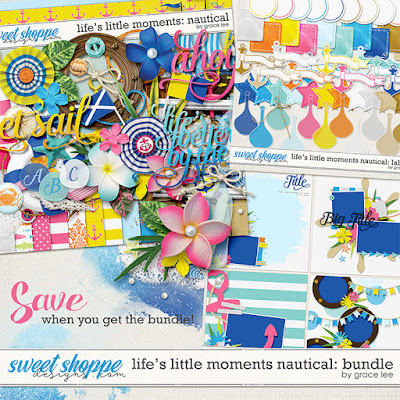 Life's Little Moments Nautical: Bundle is an ocean-themed kit with refreshing colors and lots of beachy elements that make this kit a great match for any summer layout. If you're looking for a kit to scrap a vacation, whether on the shore or on a cruise, you don't need to look any further! and 50 elements. The elements included are 3 anchors, 1 bottle, 1 bow, 1 branch, 3 buttons, 2 flags, 3 flairs, 9 flowers, 1 foam, 5 foliage, 2 frames, 1 lighthouse, 1 paint, 2 ribbons, 1 ring, 2 ropes, 1 sand, 1 scatter, 2 shells, 1 ship, 2 stamps, 1 starfish, 3 word art, and 1 wheel.